FUNdaMENTALS Body Project offers private and group instruction in Physical Alignment and Stage Movement for the performing arts. The goal of the alignment teaching is for the student to become essentially self-sufficient in maintaining and warming-up the body for performance. 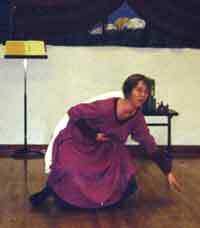 Stage movement teaches the performer both the practical and artistic "languages" of the stage space. Lissa Tyler Renaud was introduced to dance at the age of three, at Gays Nursery School; she was performing by the age of eight, dancing in both childrens and adult productions. She went on to study ballet with Mme. Alexandra Sawiska of the Bolshoi Theatre, modern dance at the Shawl-Anderson School of Dance, and jazz dance and pantomime at UC Davis. At the university she also acted on a long-term interest in choreography, creatingamong other works--the "Jabberwocky" for the Drama Departments popular Studio B series. She was also invited to both dance and choreograph for Peter Schumanns Bread and Puppet Theater in Vermont. Ms. Renauds interest in movement took a decisive turn when she met dancer/choreographer John McConville in 1984. Mr. McConvilles inquiry into Physical Alignment represented a profound synthesis of his own professional bodywork practice with the disciplines of Joseph Pilates, Moshe Feldenkrais, Mabel Todd, ballet, modern dance, eastern dance, yoga and many others. Ms. Renaud began her many years of study under Mr. McConville, also dancing with him in his original choreography and collaborating on various operatic and other public performances. On the basis of their work together, with soprano Christine Sanders they eventually founded the Actors Training Project in Oakland, CA. In 1990, when Mr. McConville returned to his artistic home, Thailand, he entrusted Ms. Renaud with his movement teaching in the program there. Under Mr. McConvilles guidance, Ms. Renaud went on to sustained Pilates study at the Center for Dance Medicine in the St. Francis Memorial Hospital in Walnut Creek, and at Mind-Body Connection in Oakland. She has received additional instruction in Ideokinesis from the eminent Andre Bernard of NYU, from Wayne Dimond (Head of Physical Therapy at Kaiser, Oakland), as well as in Somatics, Eutony, and a score of other physical re-education approaches relevant to care of the performers body. Ms. Renauds work in Alignment is firmly grounded in the revolutionary physical re-education movement that came out of Europe in the early part of the century. The Alexander Technique and the Pilates Technique are perhaps the bodies of work most familiar to us from that period. Practitioners of this work have typically come from the fields of kinesiology, biomechanics, anatomy, physiology, dance medicine, dance and a range of other theatre disciplines. The physical re-education movement originally developed in opposition to the conventional, mechanical physical training that can still be seen today. Alignment work brings a more complete approach to the training of the body. It uses simple movements and the bodys own weight to promote musculo-skeletal health. It is particularly suited to training performers because it focuses on the connection of both mind (actors imagination) and body (movement) to the breath (voice). The breathwork uses simple, organic principles to promote natural breathing. the joints of the skeleton and their related muscles are working together in a harmonious relationship. By learning to focus on the interior space of the body and the bodys natural plumbline in relation to natural gravity, students are prepared for the physical stamina and expressivity they need for performance. This non-impact training includes both floor, sitting and standing sequences. It uses the bodys own weight for stretching and strengthening. The sequences are tailored to the individual. A splendid survey of major practitioners in this field can be found in BONE, BREATH AND GESTURE (ed. Don Hanlon Johnson, North Atlantic Books, Berkeley, CA 1995). Lissa Tyler Renauds instruction in Stage Movement is organized into three inter-related components: 1. Stage Mechanics 2. Stage Savvy 3. Stage Space. 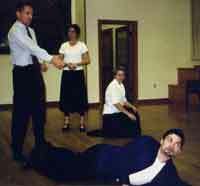 Stage Mechanics offers the basics of stage movement: walking, sitting, crossing, turning; leg, foot, head and arm positions (gesture); countering, staying open, handling props, use of the focus point. Also blocking notation. Stage Savvy gives students tools for negotiating the stage space, with an emphasis on the illusoryrather than realisticnature of the performance area. Performers learn how the different areas of the stage function, and the meanings expressed by various floor plans in relation to character. Stage Space is designed to further inform the students' natural impulses for how to inhabit stage pictures in a three-dimensional space (composition). This component of the instruction is inter-disciplinary. It synthesizes the spacial-related thinking of performing arts professionals with ideas drawn from the fine arts and architecture. It also includes reference to conventional and alternative medical and scientific research. References: Point and Line to Plane, by Wassily Kandinsky. This book was originally intended for the training of painters. The translation of its teaching into actorly terms was the subject of my doctoral work (Ph.D., UCB 1987). Also, Pedagogical Sketchbooks, by Paul Klee. Ms. Renauds group instruction in movement for the performing arts has been a cornerstone of the curriculum at the Actors Training Project in Oakland since 1990. Theatre and movement professionals from many countries have come to observe her work. She has also taught her movement work in master classes in Nevada and Colorado, and in Guest Lectureships benefiting singers and musicians around California and in New Mexico. Ms. Renaud also offers private instruction in Alignment for clients with a wide range of backgrounds. Movement instruction is an integral part of the voice training she has provided for actors and other top professionals at the Voice Training Project since 1975. Renauds alignment practice has supported clients in recovery from injury or illness, prepared them for high performance in sports, and provided ongoing physical conditioning. Ms. Renaud is an active member of several online professional discussion groups, where she both writes about her teaching, and has access to an international network of colleagues who are forming and tracking the latest approaches in the movement field. Videos of Ms. Renauds group teaching are archived and available to her students.